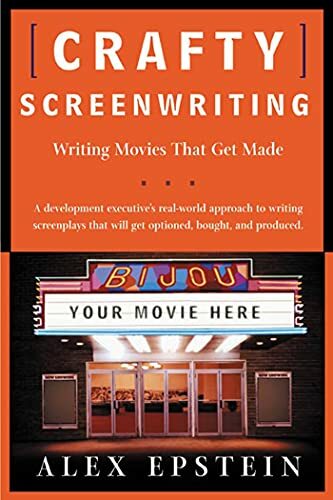 The most innovative and creative screenwriting book yet, from an author who knows first-hand what it takes to get a movie made. Based on an award-winning website hailed as "smart enough for professional screenwriters and accessible enough for aspiring screenwriters", Crafty Screenwriting is the first book not only to offer a successful screenwriter's tricks of the trade, but to explain what development executives really mean when they complain that the "dialogue is flat," or "the hero isn't likeable." Fresh, provocative, and funny, Alex Epstein diagnoses problem that other screenwriting books barely address, and answers questions they rarely ask, like "Why is it sometimes dangerous to know your characters too well before you start writing," or "Why does your script have to be so much better than the awful pictures that get made every day?" As a development executive who has accepted and rejected countless screenplays, and a produced screenwriter himself, Epstein can take you into the heart of the most important question of all: "Is this a movie?" A crucial book for anyone who has ever wondered what it takes to get their movie made. Alex Epstein has worked as a development executive, screenwriter, and television story editor for more than a decade. He has helped develop projects with directors such as Richard Attenborough and John Badham. A graduate of Yale University and the UCLA School of Film and Television, he is the creator of the popular website www.craftyscreenwriting.com.